Happy “birthday” to all Redemptorists and our collaborators around the world! 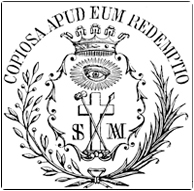 Today is the 279th anniversary of the founding of the Congregation of the Most Holy Redeemer. St. Alphonsus Liguori’s dream became a reality on this day in 1732 when he and a handful of followers first began to live and work toward one goal: preaching the good news of God’s plentiful redemption to all, especially to the poor and most abandoned. Since then, St. Alphonsus’ spiritual sons have multiplied and spread throughout the world. We’re now 5,300 strong serving in 76 countries! We thank God for the blessings of these last 279 years and ask the intercession of Our Mother of Perpetual Help as we continue following in the footsteps of Our Redeemer. of plentiful redemption to the most abandoned. or who need to hear your word proclaimed anew. as partners in the Redemptorist mission. your Word, who is our Life.